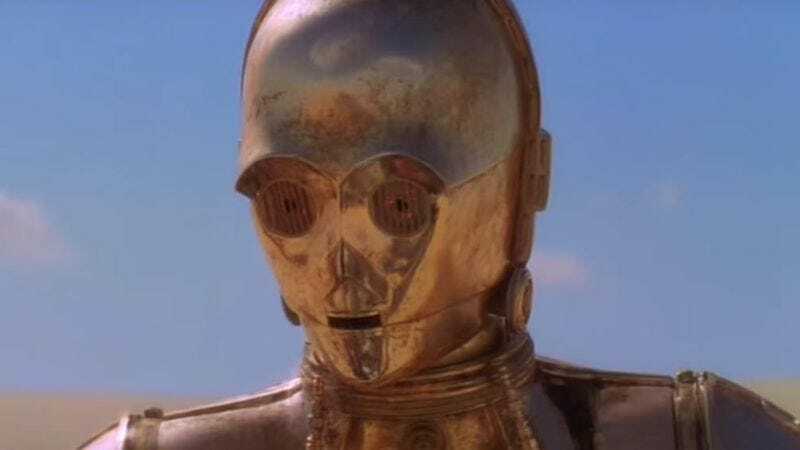 There is only one actor who has appeared in every single Star Wars film to date: 69-year-old Anthony Daniels, who has been portraying the fussy gold-plated protocol droid C-3PO since 1977. Over the course of seven films, not to mention countless cartoons, games, and commercials, C-3PO has become such an integral part of popular culture that it is easy to forget there is indeed a living, breathing, thinking actor inside that iconic, shiny costume. Vulture’s Boris Kachka recently spent some time getting to know Daniels and turned his findings into an article poignantly titled “The Last Human Robot.” That title refers to the fact that characters like C-3PO “could easily be digitized,” but new Star Wars overlord J.J. Abrams has insisted on retaining as much “corporeality of the early movies” as possible. That devotion to the original trilogy extends to hiring as many veterans of the first three films as possible, including Daniels. It was Daniels who insisted on donning the heavy, uncomfortable suit for The Force Awakens. “There was no way I was just going to do the voice,” the actor said. One seminal moment for me was patronizingly saying to a group of Stormtroopers, ‘What do you do when you’re not dressing up?’ One was a surgeon, and one of them was an oceanographer. After that, I shut up.